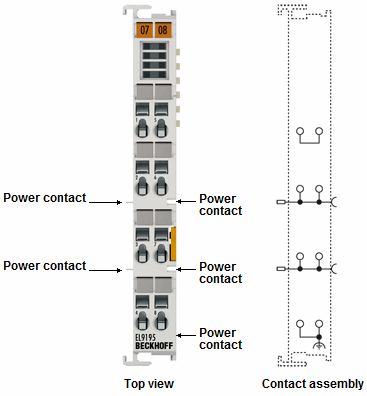 The EL9195 EtherCAT Terminal allows the supply voltage to be accessed a number of times via spring force terminals. It makes it unnecessary to use additional terminal blocks on the terminal strip. The EL9195 can be used for the connection of screens. The EL9195 connects the spring force contacts directly to the DIN rail, and can optimally ground incoming electromagnetic radiation. The two power contacts are looped through by the EL9195, allowing two wires to be connected to each power contact.